At Crown Oil, we wear our love for local football on our sleeve. As proud sponsors of the Dale, we’re always keeping a close eye on what our favourite team is up to on AND off the pitch. Now that football season is back in full swing, here’s the first of our monthly round-ups on all things Rochdale AFC. After enduring 3 losses, 1 draw and only 1 win, Dale fans perhaps believed last Saturday’s derby against Bury FC would provide a much-needed morale boost. Needless to say, the 0-0 draw we ended up with did little to cheer up either side. “There are so many things that are tripping us up that it almost feels like there’s some agenda against us that isn’t our fault. The players that represented us today were magnificent when you consider that we had to make two substitutions in the first half, with all my options going into the embers of the game gone. Take a leaf out of Keith’s book – with the odds stacked against the Dale, the best thing to do is keep your chin up and look to the future. With any luck, September will be a month to remember, for all the right reasons. Rochdale rounded out the Summer transfer window with three deals on deadline day. 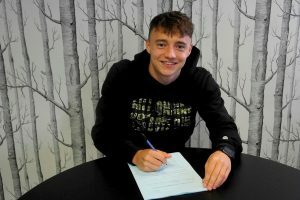 The major deal saw long-time Dale midfielder Jamie Allen make the step up to the Championship after being snapped up by Burton Albion for an undisclosed fee. The Dale also welcomed two new loan signings to the Crown Oil Arena. Midfielder Jordan Williams completed a loan move from Liverpool while defender Donervon Daniels completes a temporary switch from Wigan Athletic. In other news, midfielder Ollie Rathbone’s contract has been extended until June 2019. The talented 20-year-old joined Rochdale AFC last summer after honing his skills within Manchester United’s youth ranks. “Coming to this club has been a revelation for me. We’re glad he’s enjoying it, as we’re certainly looking forward to watching Ollie work his magic on the pitch over the next two years. 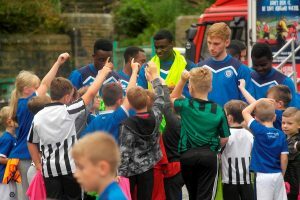 As official sponsors of the Rochdale Feelgood Festival, Rochdale AFC sent manager Keith Hill on Friday afternoon to deliver a mini-training session for kids to take part in. From 2pm, Hill and members of the youth squad turned up to share their skills with Rochdale’s youngsters. To top it all off, Desmond the Dragon put in an appearance and posed for photographs with the locals! All in all, the event was a fitting prelude to a weekend of incredible music and entertainment, in part courtesy of indie giants Razorlight. To see pictures from the event, visit the official Rochdale AFC website here. Check back with us at the same time next month to see how the Dale do in September! We’ve got a good feeling it’s all uphill from here.